One may be surprised to note that a new life is beginning for the citizens of Mangalore, in a small stall at the Karavali Utsav. It is in two fronts- one the program for the improvement of health and the other for the improvement of mileage- both available in the same stall. The “latest technology” in each has the same basic intention- improvement of energy level- one in the human body and the other in the internal combustion engine. 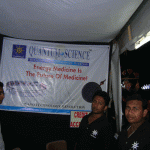 The body first: This is the quantum science bio tech optimum energy program for you. 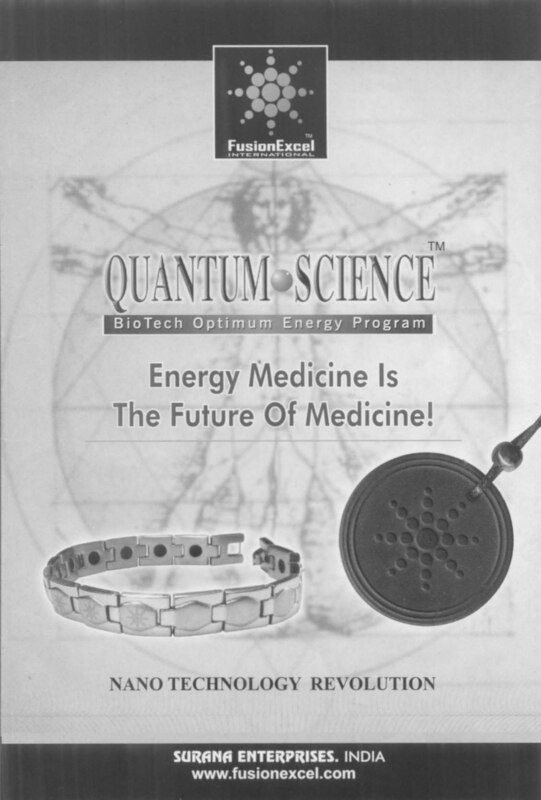 As the blurb promises, energy medicine is the future of medicine. The nanotechnology revolution as promised by Fusion Excel international and promoted by Surana Enterprises India and their website being fusionexcel.com. The introduction starts with what is energy and then goes on to promote the quantum science scalar energy pendant created from a mixture of “more than 70 kinds of energy releasing mineral materials selected from Volcanic rock”. It also promises of scalar energy which can do miracles like increasing oxygen supply to blood stream, cleansing of blood of unwanted dirt like fats and cholesterol, pain relief, fighting cancer cells etc. Besides that it also balances both sides of the brain, promises better sleep, freedom from fatigue etc. In short it is the panacea that mankind has been waiting for from a long, long time. The device can be used by wearing it on a chain or carrying it in ones pocket. There was also a person demonstrating the instant results derived by putting the amulet in ones pocket. I was made to raise my hands which were then put down with his two fingers (obviously he was a man with strength- he was wearing the energy pendant around his neck!). Then he made me put the same in my pocket and lo behold! Even his super powers of the pendant were unable to push down my hands which had instantly become charged with the magical powers of the pendant. He also promised me that the gadget would lower blood pressure, blood sugar levels and reinvigorate me. The person conducting this experiment had been a rickshaw driver and was surely in an authoritative position to endorse the product! Mind you ladies and gentlemen all this for a mere 6,990 rupees. After the body come the automobiles. I was then shown the device which would cause a revolution in the field of motoring. 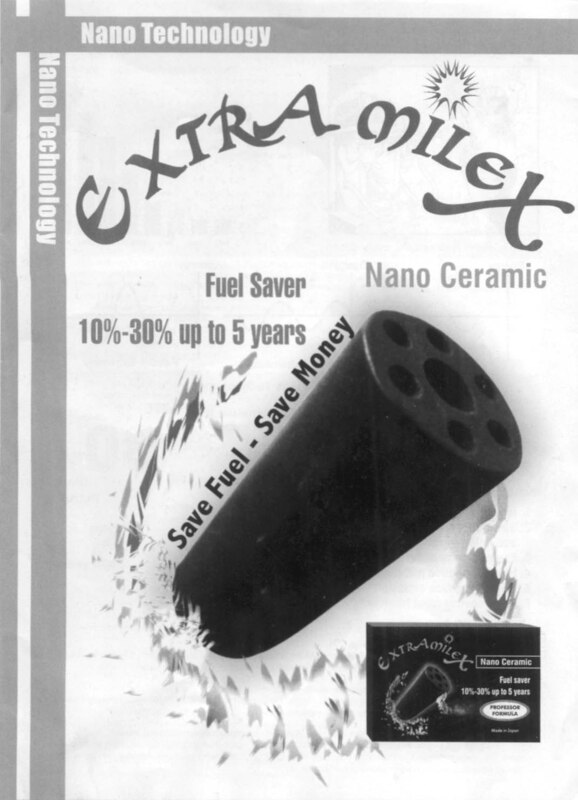 That was the Extra Milex Nano ceramic fuel saver. It could save fuel and save money. The normal fuel being large clumps of molecules would be miraculously broken into nano particles which would increase the efficiency and mileage, it was also environment friendly. The pollution and emissions would be reduced! It was very obvious to me that the oil cartels had reduced the oil prices after noticing that this gadget had come into the market. They had understood that the oil consumption would go down significantly and cause the market to crash. So, now we can all understand the reason for the crash in crude oil prices. Well for those ignorant of “science” the pamphlet of Extra Miles has some lessons too! It defines nano and nano technology and also mentions Einstein’s equation linking mass and energy. However, like all good things in life this gadget does not come cheap. It costs Rs.1990 per piece. For a two wheeler fuel tank two are needed. The larger tanks need more in number. We hear that these gadgets have resulted in closure of a number of petrol outlets in Mangalore. Soon to follow will be the Nursing homes and the medical consultant’s chambers. The pharmacies are on the way to extinction and the mushrooming medical, dental and physiotherapy colleges are being downsized. The population of Mangalore should consider themselves extremely lucky for being considered as the first to receive these miraculous gadgets with the latest technology. A few minor things like the lack of scientific evidence should not come in the way of acceptance of these. The web site mentioned above showed a number of pictures of “doctors” and testimonials from their ‘patients’. There were also clips of patients being tested for strength before and after wearing the gadget in the same manner as it was done to me by the former rickshaw driver mentioned above. We would be glad to know the views of the Assistant Drugs Controller for Dakshina Kannada about the gadget which is a cure for all as it contravenes the provisions of the Drugs and Magical Remedies (objectionable) Advertisements Act. We are also informed that any device which can be used in any automobile or any other vehicle should be approved by the Automotive Research Center, Pune. We would also like to know as to how such stalls are allowed in Karavali Utsav by the district authorities? Nice post Ajita. The first hint that this maybe a fraud or a pseudo-scientific poduct is the photo of Mr. Emoto, of water crystal fame, on their website. Mr. EMoto claims have been widely criticized as pseudo-science, so any endorsement from him is a no-no for me. Btw, the finger pushing trick is a classic magic trick. I remember watching it once on youtube although I couldn’t find it now. It has to do with how our muscles are arranged or how they behave under certain circumstances or something like that I can’t remember. Anyway how did other people react to this product? Were they selling the product? Hi Nitwit Nastik. The post was actually written by Narendra Nayak. Thanks for the input on the trick. Narendra himself may be able to post a reply to your question about how others reacted to the products. The trick was by appearing to push while actually not putting much pressure. First time he really pushes and after putting the pendant in the pocket he acts as if he is pushing but actually exerts little pressure.That is the standard trick done by many including some stage hypnotists. I could not see any one buying the products when I went. Usually the comments come after people try the product and then realise they had been taken for a ride and it takes a long time. By that time the vendor would have disappeared! Their product literature also contains very clever declaimers. The matter could be taken to a court for clarification but since I am on tour most of the time, I leave it to some one else to do that. The same write up has been also published in the local press and I am waiting for the reactions. For the straight thinking people who are also a little informed, these sort of things only have a time pass/entertainment value. Unfortunately we have a large educated class who consider themselves to be more informed than what science is capable of explaining. These people firmly believe that the world at large is not capable of understanding top order science , but they are. For such people, vipasana, Satyanarayana Raju brand of magic etc., is also science not understood by others. One cannot convince such people. Testimonials are after all anecdotal evidence! Sad to see people being fooled! I want to know more about this scam. But I want to know the real feeling and how it is the being scam from the person who used before, the such mentioned nano scalar what so ever products. And some more, it is consider expensive for normal worker like me. Instead of being critic to one products on no ground, I want to critic the product on realistic from user point of view. Please, advise me before I buy it. I have to spend my 2/3 of my salary. On top of that my cell phone doesn’t give me headaches anymore since I started wearing one. I’m skeptical of everything, however when I try something myself and it works I’m sold. I’d suggest people try these things out first before judging them. I will say that these things are being sold for WAY too much though by MLM companies. Better off just buying one for cheap, its the same thing. An article should also be written on the so-called quantum healing practiced by Internationally renowned quack–Deepak Chopra….One should listen to his interview with Richard Dawkins…… He sounds less intelligent than apes!!! Well, There have been more scientific experiments on the clumping, unclumping of blood cells, increase in energy of the cancer (energy depleted)cell, resulting in stop and reversal of cancer growth, which cant necessarily be depicted in a camp like this. Scalar Energy works. I would suggest that you guys do a more in-depth research rather than just commenting like this just after one demonstration in a camp. There have been loads of scientific experiments in this field and established facts as well.